Microsoft’s latest operating system, Windows 7, will be available for purchase on October 22, 2009. Released just in time for holiday shopping, it has been priced to sell, with pricing set lower than equivalent Windows Vista editions. This article highlights 7 compelling reasons to spend your hard earned dollars on a Windows 7 upgrade this holiday season. Reason 7: It looks and responds better than XP and Vista. The user interface has been improved with Windows 7, leaving a cleaner, more functional look than previous Microsoft operating systems. Aero Peek is one of the exciting new user interface features. 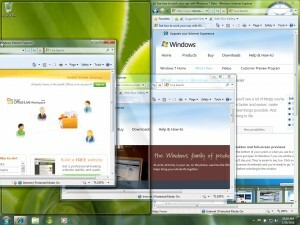 It changes the way you view windows by leaving all open windows transparent except the one you’re currently using. The re-designed taskbar makes it possible to display more information in less space. 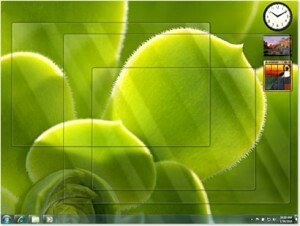 Windows 7 also introduces new touch and gesture functionality, making common tasks more intuitive. 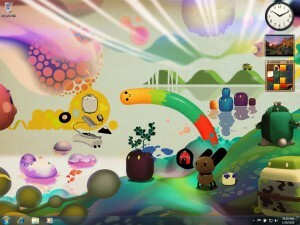 As an added bonus, Microsoft has included a library of colorful, innovative desktop wallpapers with this release. Windows 7 produces better graphics that are more pleasing to the eye without slowing your computer down. Reason 6: Enjoy a longer laptop battery life. Windows 7 uses even less energy to run on a laptop battery than did Windows Vista and Windows XP. With improved power management tools and power optimizations in the Windows 7 code, you’ll be able to watch longer movies, work longer and get more use from your laptop while traveling. This is great news for those of us who are tired of being forced to carry two laptop batteries just to have enough power for a cross-country flight. Reason 5: Libraries of information make organizing simple. Microsoft Libraries have made it easier for you to organize all of the information on your computer in one place. Rather than requiring users to save all their information in the “My Documents” folder, Windows 7 recognizes that documents, pictures and other important files will frequently reside in several different folders spread across different physical drives. Libraries allow you to group these files and folders in a single easy-to-view interface. 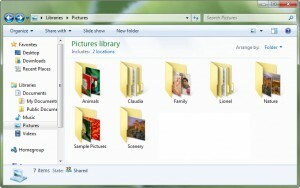 For example, you can take all of the pictures in your “My Pictures” folder and combine them with pictures stored on an external USB backup drive and other pictures stored on another computer on your network. You will then be able to group, sort and view all of these images in one place as if they resided in a single folder. Reason 4: Touch screens simplify your work. Several years ago at technology trade shows, exhibitors were introducing their own next generation touch screen products. The new touch screen features embedded into Windows 7 will allow computers to catch up with features currently found only on the iPhone and similar hand-held devices. Don’t be surprised to see laptop and netbook computers that will soon eliminate existing mouse and pointer devices in favor of a touch screen interface. Microsoft insists that touch screens will be a large part of computing in the future and they have cemented their support for it with Windows 7. People who do most of their work on a computer expect it to be fast enough to get their job done quickly. Vista was slow and Microsoft learned early on that speed was the single biggest reason Vista users later downgraded back to Windows XP. It’s no wonder Vista wasn’t the success Microsoft had hoped for. Microsoft has spent a lot of time making Windows 7 faster for common functions, in some cases even faster than Windows XP. But Windows 7 isn’t only about work; even serious computer gamers will be happy with this release. Reason 2: You won’t need to buy a new computer. With previous releases of XP and Vista, Microsoft expected consumers to wait for a new computer system before upgrading the operating system. Most people had no other choice, as their old computer hardware could not efficiently handle the upgrade. Windows 7 is different. Most computers sold in the last few years will be able to run Windows 7 adequately. You will be able to purchase the Windows 7 upgrade and install it to your existing computer without the same slowdown issues that many people experienced when upgrading from XP to Vista or from 2000 to XP. You’ll even be able to install and run Windows 7 on slower netbook computers with speeds comparable to existing XP netbook performance. Reason 1: It’s better than any previous operating system. Getting a better product with more advanced features than the one you’re using now is the most compelling reason to upgrade to Windows 7. Windows 7 incorporates new innovations. If you’re still using XP, you’re stuck with the limitations of technology developed eight years ago. Initial reviews have shown Windows 7 to be well designed with fewer bugs. If you’re using Vista, you still experience several bugs and issues no matter what you’ve done to patch and tweak the operating system. Microsoft has set the bar high with Windows 7, providing next generation features that you won’t find in any other operating system combined with improved core applications and the same legendary Windows device support and ease of use found in previous Windows versions. Overall, many new features come loaded with Windows 7 that make it easier to find what you’re looking for and faster to get your job done. Microsoft has somehow found a way to incorporate new features while improving upon the look of Windows Vista, all while utilizing far fewer resources than Vista. Microsoft put forth extra effort with Windows 7 and it shows. It’s starting to look like the 2009 holiday season will be a happy one for Microsoft…and users of Windows 7. For more information about Windows 7, visit the Microsoft Windows Vista website at www.microsoft.com/windows/windows-7/. Andre Morris (www.facebook.com/my.PC.Techs) is the President of my PC Techs, a Phoenix on site computer repair and website design company that stands by its promise: Technology you can trust. Support you can afford. They offer expert business and residential IT support, website services and SEO at very affordable pricing. For questions about Windows 7 or any other technology issue, please contact my PC Techs at (602) 692-6423, email andre@mypctechs.com or visit their website at www.mypctechs.com.